M&S Parking: Residents petition city for changes at Kew Gardens' "Intersection of Doom"
New York City's Parking Ticket Experts- Knowledge. Experience. Savings. Don't pay another New York City parking ticket until you contact M&S Parking, Inc. We know your time is valuable - why spend your days fighting parking tickets when we can do it for you? 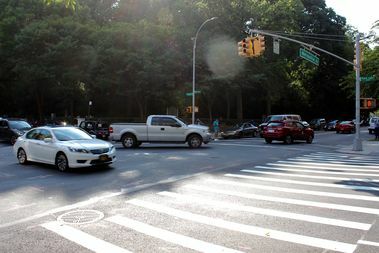 Residents petition city for changes at Kew Gardens' "Intersection of Doom"
Residents in Kew Gardens are petitioning the city to make some major changes to a corner they've nicknamed the "Intersection of Doom." The intersection, located at Park Lane South and Metropolitan Avenue, has been the site of nine injuries resulting from crashes from 2012- 2016. Petitioners are asking for a red light camera on Metropolitan Avenue, lane separators on Park Lane South, and extra time for crosswalk signals. “On a daily basis, pedestrians are faced with cars speeding well above the 25MPH limit along Metropolitan Ave., dangerous drivers who turn against the left-turn light on Park Lane South with no regard for pedestrians who have already entered the crosswalks, and cars and motorcycles who have taken to racing along Metropolitan Ave. at night as though it was part of the Grand Prix course,” residents wrote in the petition. Councilwoman Karen Koslowitz contacted the Department of Transportation and the agency plans to conduct a study of the intersection. The DOT is already working on a larger safety project for the Park Lane South corridor which includes the Metropolitan Avenue and Park Lane South intersection. The proposal will be presented to the community this fall. New Medical Certification Requirements for CDL Holders in Effect. © Copyright 2010-2016 M&S Parking Inc. All Rights Reserved.. Powered by Blogger.